Turkish-US relations have deteriorated in recent weeks, with Washington threatening reprisals if Ankara goes ahead with the purchase of the Russian-made S-400 air defence system. In testimony before a congressional committee Tuesday, the acting US defense secretary, Patrick Shanahan, signalled that if Ankara proceeds with the S-400 purchase, Washington will block further shipments of F-35 fighter jets to Ankara and cut Turkish companies out of the F-35 project. “We absolutely do,” then added, “We need Turkey to buy the Patriot.” This was a reference to Washington’s offer to sell US-made Patriot missile batteries to Ankara for $3.5 billion in lieu of the S-400. 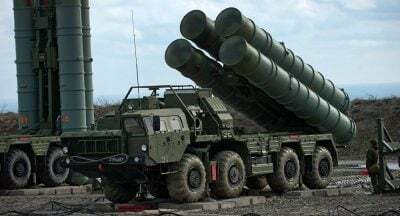 If Turkey deploys the S-400 it will run afoul of US sanctions against Russia. The 2017 Countering America’s Adversaries Through Sanctions Act empowers the president to impose sweeping sanctions on any individual, organization or state that enters into a “significant transaction” with the defence or intelligence sectors of the Russian Federation. Washington could also seek to intensify pressure on Ankara by refusing to grant Turkey an extension of the “waiver” exempting it from the unilateral and patently illegal US embargo on Iranian energy exports. Turkey is heavily reliant on Iranian natural gas. Erdogan has, nonetheless, repeatedly vowed that Turkey will buy and deploy the S-400. In his latest comments on the subject, made in an interview last Sunday with television broadcaster TGRT Haber, Erdogan declared that no matter what the United States says, Turkey will not reverse its position on the deal. The dispute over the S-400 is a flashpoint for deeper conflicts bound up with Turkey’s geopolitical and military-strategic orientation. A member of NATO since 1952 and a key Western ally during the Cold War, Turkey has been severely destabilised by American imperialism’s more than quarter-century of uninterrupted war. Bordering Syria and Iraq to the south and with significant economic and political interests in the nearby regions of the Balkans and North Africa, Ankara was directly impacted by the first Gulf War, the Western-backed carve-up of Yugoslavia and NATO’s bombardment of Serbia, the 2003 Iraq invasion, the 2011 air onslaught on Libya to topple Gaddafi, and the ongoing bloodbath in Syria. With Syria matters came to a head. Initially Erdogan enthusiastically supported the US fomented regime-change war in Syria and Ankara was a major co-sponsor of the Islamist militias that spearheaded the drive to overthrow Bashar al-Assad and his Baathist regime. But Turkey was incensed when, once those militias had been pushed back, the US forged an alliance with the YPG, a Syrian offshoot of the Kurdish Workers’ Party (PKK), against which Ankara has waged a brutal counter-insurgency war for over three decades. It was within this context that Turkey orchestrated a rapprochement with Russia and intensified cooperation with Iran. Erdogan has used the dispute with Washington over the S-400 to capitalise on popular hostility to US imperialism ahead of Turkey’s March 31 nationwide municipal elections. However, he has given little indication he plans to alter his stance towards Washington after the elections. On April 8, the Turkish president is due to travel to Moscow for one-on-one talks with Vladimir Putin. Commentary in pro-government Turkish media indicate the anger within elite circles over Washington’s failure to accommodate what they perceive as their vital interests, and their fears that the country that has been Ankara’s principal military-security partner for decades can no longer be trusted. A common refrain is that if Turkey abandons the purchase of the S-400 and accepts Washington’s offer of the Patriot missiles, it could soon face additional US conditions, including making accommodations on Israel or Syria.